According to researchers at EMPact America, an organization dedicated to studying and preparing for the possibility of large-scale electro magnetic pulse threats that can destroy our modern day electrical infrastructure, the earth came dangerously close to a serious destabilization event. A couple of weeks ago the sun emitted a massive CME (Coronal Mass Ejection) that, had it been earth-directed, would likely have wiped out critical portions of the world’s power grid and sent developed nations back to the stone age within a matter of seconds. ‘The world escaped an EMP catastrophe,’ Henry Cooper, who now heads High Frontier, a group pushing for missile defence, told Washington Secrets. ‘There had been a near miss about two weeks ago, a Carrington-class coronal mass ejection crossed the orbit of the Earth and basically just missed us,’ added Peter Vincent Pry, who served on the Congressional EMP Threat Commission. It was a “Carrington-Class” event, named after the 1859 incident that left telegraphs around the world inoperable and reportedly even lit some of the equipment on fire because of the electric surge. Solar flares are measured in classes, and though “Carrington” is not an official classification on the scale, it refers to a solar emission so powerful that it would send Aurora Borealis, or Northern Lights as they are often called, as far down as the equator (as was the case with the 1859 event). This means that the size of the solar flare would be massive, and the charged particles contained within it would be widespread, likely affecting every non-shielded electronic device on the planet. The original Carrington event is estimated to have been larger than an X10 Class flare – a super solar flare. The measurements work similar to the earthquake Richter scale, where the next level up is 10 times more powerful than the one before it. An X1 flare, which is the lowest level of the X flares, is capable of disrupting electronic devices like satellites and even mobile communications. And X2 flare, would be ten times as powerful as the X1. A Carrington Event flare would exceed X10 Class, making it thousands of times more powerful than an X1, with the capability of disrupting, or even rendering inoperable, everything from electric grid transformers and water utility plants, to cell phones and vehicles. Though such powerful flares as the one that almost hit earth two weeks ago are rare, they happen more often than you may think. In November of 2003 an X28 Class solar flare – the largest ever recorded – narrowly missed earth. Were such a powerful electro magentic pulse to hit hit the earth and wipe out critical infrastructure elements like utilities, satellite positioning systems and transportation, civilization as we know it would devolve into chaos within a matter of hours. Estimates suggest that in such a scenario 90% of America’s population would perish within one year’s time due to lack of food, clean water, medicine and other critical services currently made possible by on-demand electrical infrastructure. The grid could be crippled at least four different ways, Bartlett says: terrorist assaults on power substations, a cyberattack, a massive solar storm and an electromagnetic pulse attack. Bartlett has for decades warned of the harm of an EMP attack — a nuclear detonation in the atmosphere that could fry computers and anything with an electric circuit — in his writings, in legislation and in late-night speeches on the House floor, though experts differ on the seriousness of the threat. Some agree the dangers are real, while others say such an attack is unlikely and the potential effects remain uncertain. “Whatever level you’re concentrating on, being as self-sufficient as you can, as quickly as you can, is going to be the right thing to do,” he says. A solar flare or man-made EMP (in the form of a Super EMP weapon) is an outlier. Two weeks ago, had the sun spot that emitted the Carrington-like flare been directed just a few degrees in our direction, we’d be living in a different world today. Likewise, ten years ago, the earth took a glancing blow. We have come close, and one day chances are an earth directed flare will take out our modern-day electrical infrastructure. It could happen a month from now or 10 years from now during the next solar maximum cycle. What we know is that it has happened before, and it will happen again. Relocate out of major cities if possible, or have backup plans if doing so is impossible. Strategic relocation specialist Joel Skousen and Alex Jones have put together an informative (and free) documentary that is a must watch for those looking to exit large population centers. Once your basic plans are in place, develop a long-term preparedness plancentered around building up your stockpiles, skills and strategies over time. There are a variety of civilization-affecting threats that we face, so preparing for an EMP attack or solar flare will actually ready you for a whole host of other worst-case scenarios. If you haven’t, start take it upon yourself to prepare today, because those who aren’t ready when disaster strikes will be destined to a fate of hardship and horrors. It’s better to be prepared a day, a month or a year early, than to be one minute too late. 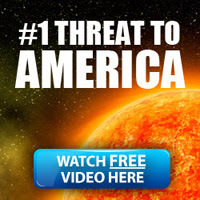 Be the first to comment on "Carrington-Class Event: “The World Escaped an EMP Catastrophe”"